2001: A Space Odyssey is a 1968 science-fiction film by director Stanley Kubrick, with the story based on a novel by the author Arthur C. Clarke. 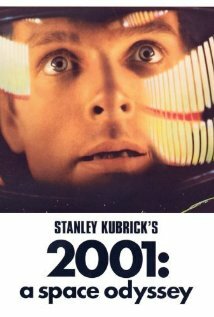 The plot of the film is difficult to describe, but it essentially involves the expedition with two astronauts and a highly sophisticated artificial intelligent computer called HAL 9000 to Jupiter, tracing a strange signal. The quick plot blurb from imdb.com states, “Humanity finds a mysterious, obviously artificial, object buried beneath the lunar surface and, with the intelligent computer H.A.L. 9000, sets off on a quest.” The film’s themes include evolution, technology, extraterrestrial life, and artificial intelligence. I think 2001 can be viewed in three ways. 1) It is a sci-fi and film classic that still holds a hypnotic power over the viewer, 2) It is a curious culture piece from a decade focused on space and the moon or, 3) It is an overly praised, pretentious, agonizingly slow snooze-fest with a drug induced cop-out ending. After thinking about 2001, I was struck by two features of the modern world. First, movies today lack pacing. As our collective attention span becomes shorter and shorter, the pacing of movies becomes faster. One of my favorite aspects of 2001 is that it walks the line between thriller and slow art piece. Watching this film is just that, the audience is watching the movie; it does not feed you the plot and explain everything that is occurring. Certain aspects (the beginning, the monolith, the end, etc.) are certainly meant to be a visual and interpretative experience, but even the basic plot occurs in something of a haze. The viewer does not fully grasp the story until well into the film. It acts like a partnership, whereas the viewer must actively engage the movie. Once this is accomplished, the visuals take over the viewing experience and the myriad of questions raised as to what is driving the actions of the characters and the meaning behind the final few scenes envelop the viewer. Beyond this general shortening of attention spans, 2001: A Space Odyssey reminds me of something else that is lacking in modern America: the sense of awe and wonder in films. Remember, this film came out in 1968, a mere year before Apollo 11 reached the moon. This is still a time when the United States was obsessed with outer space. Stanley Kubrick and his creative team had to guess what the moon’s surface looked like in order to film the scenes with the discovery of the moon monolith and to be quite honest, the scenes involving the lunar surface look pretty darn good. At this point, I want to make a distinction. I began this post with the idea that modern American society has lost any sense of wonder in the world around us and in the stars. However, the more I thought about it, the more I decided that this was false. In actuality, it is in our mainstream movies in which we lack the capacity to be in awe of a setting or visual. Sure a movie comes along every now and then that is truly captivating from a visual standpoint (I would argue Avatar in this case), but for the most part, an overload of CGI has dulled out senses. A new film, Gravity, seems to capture the majesty and wonder of outer space, while focusing on the human elements of the plot. Hopefully in the near future I will have an opportunity to see this one and be reminded of what makes films such a visual experience. This entry was posted in Movies and tagged 2001: A Space Odyssey, film, HAL 9000, movies, outer space, Science fiction film, Stanley Kubrick. Bookmark the permalink.